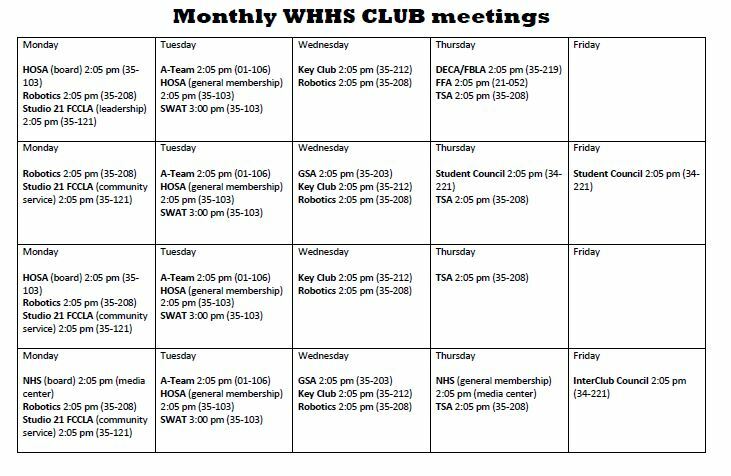 Note: Students must be an active student and enrolled in Winter Haven High School to participate in clubs. (Academy of Hospitality and Tourism) Robinson 35-219 The WHHS Hospitality and Tourism program offers an exciting opportunity for students to become world-class players in this dynamic business arena through an in-depth look at all aspects of travel and tourism. Students benefit from our unparalleled industry partnerships which provide access to guest speakers, internships, competitions, memberships, scholarships and networking opportunities that help stimulate successful careers in this exciting and booming industry. Students will compete in Orlando at the state level in the Hospitality and Tourism Management Program Competition with a chance to win and advance to the national competition. Art Bogan 36-109 The Art club meets periodically to make art, sponsor art contests and discuss artistic culture throughout the world. A-Team Thompson-Marin & Ross 01-106 Students compete against academic teams from other schools in tournaments in which players are asked questions from the areas of language arts, mathematics, science, social studies, the fine arts, world languages (French and Spanish) and technology. There are five practice rounds. Band Farr Band Students make music to perform at football games, concerts and special events. Blue Devil Gamers R. Erb 35-123 Blue Devil Gamers meet once a week and hold monthly tournaments where students compete for the top position! Looking for fun or to meet other gamers? This is the club for you. BDTV Mizelle 36-107 BDTV is a daily news show informing students and staff of daily events and interesting information. BDTV also tapes sporting events and enters video contests. BDTV is an award-winning program that has won national and international acclaim. Broadcast Journalism is the entry level class with BDTV requiring an application process. Café Blue Brown 35-107 Café Blue is an academy consisting of four classes. Students learn how to work in a commercial kitchen with real world experiences. Students can complete the program and earn ServSafe Management and/or ProStart certifications. Students can also save thousands of dollars through an articulation with Johnson and Wales University. Chess Shoffner 34-118 Students who enjoy playing chess meet periodically with like-minded peers to advance their skill levels. Culture Connection R. Walden & V. Miller 36-225 The purpose of this club is to create experiences that would help increase students’ cultural capital and provide them with opportunities for artistic expression. The Culture Connection will serve as a forum for students to share and experience culture, perform community service, and become activists for change. (Distributive Education Clubs of America) Robinson 35-219 DECA enhances preparation for college and careers by providing co-curricular programs which integrate into classroom instruction, apply learning in the context of business, connect to business and the community while promoting competition. Student members leverage their DECA experience to become academically prepared, community oriented, professionally responsible, experienced leaders. Members compete at the district, state, and national level in a variety of events in the marketing field. Drama R. Fritz Auditorium Promotes and encourages an appreciation of and participation in live theatre. In addition to its meetings and activities, the Club will stage at least two mainstage productions (the fall play and spring musical). Blue Devil Drama also sponsors the Blue Devil Comedy Brigade, the longest-running high school improv troupe in Polk County. Maynard 35-219 FBLA or PBL, as they are commonly referred, is a career and technical student organization open to all secondary or postsecondary students. FBLA- PBL offers experiences in social interaction, leadership, fall and spring conferences, and national conferences. Students choose from over 75 different competitions at the district, state and national level. (Fellowship of Christian Athletes) Warren 36-104 Fellowship of Christian Athletes (FCA) is a campus ministry that is initiated and led by student-athletes and coaches. The purpose of Campus Ministry is to share the Gospel of Jesus Christ with the lost and to grow and mature as a follower of Christ. In FCA students will be challenged to reach their friends and teammates with the love of Christ and serve on and off campus and be the hands and feet of Jesus. (Future Farmers of America) Hobbs 21-052 AG Future farmers show and sell animals, participate in speaking competitions and science competitions. Additionally, they do leadership activities, supper camps, and work with all kinds of crops. Freshman Class Layne 34-122 Freshman class officers and representatives create a float for the Homecoming Parade, help clean up after the Homecoming Dance, serve as Prom Pages and assist in any student council events. GSA Monaco 35-203 Supporting LGBTQIA students and allies. Guitar J. Miller 34-Media Additional practice time and performance opportunities for students in the Rock Academy. (Health Occupations Students of America) Hileman & Wiebe 35-103 100% healthcare co-curricular organization that provides students leadership development, community service and recognition for knowledge and skills. Interact TBA TBA Interact is a service club in which students can work together on community service projects in accordance with Interact clubs of communities nationwide. Junior Chef Club Brown & Zinsmeister 35-107 With Family Career and Community Leaders of America, students participate in competitions at state and national FCCLA conferences. Students also participate in ProStart competitions and have opportunities to earn college scholarships. JROTC Sgt. Maj. Carter 36-121 Cadets learn the seven Army values, compete in drill competitions, Raider competitions, Rifle competitions, and participate in service learning projects. JROTC helps with the Special Olympics, parks cars and cleans up the stadium after football games. Junior Class Archambault & Walker 34-221 Junior class officers and representatives create a float for the Homecoming Parade, tally Senior notables, and plan Junior/Senior Prom through fundraisers including Powderpuff, Talent Show and Calendar Couples. Key Club Brown 35-212 Key Club International is the oldest and largest service program for high school students. It is a student-led organization that teaches leadership through service to others. National Honor Society Bachman & Lewis Guidance Office Eligible students are invited to join this Nationally recognized club based on grades, faculty approval, and community service. Orchestra J. Miller Orchestra Students further their study of string orchestra performance through extracurricular opportunities including All County Orchestra, Solo & Ensemble Festival and Youth Symphony Honor Ensemble. Robotics D. Hall 35-208 Students on this team compete against other schools to build and design robots. Robots that the team design compete in a technology challenge and can advance from state, to nation, to world competitions. Senior Class Bachman & Lewis Guidance Office Senior class officers and representatives plan events for their class including Senior Fling, Grad Bash, and the graduation ceremony. Sophomore Class R. Walden & V. Miller 36-225 Sophomore class officers and representatives create a float for the Homecoming Parade, provide refreshments for the Homecoming Dance, serve as Prom Pages and help with any duties assigned by student council. Student Council Archambault 34-221 Representatives from each grade meet to form a student government which organizes elections, Homecoming, and other important events throughout the year. They also promote community service by sponsoring school-wide programs such as Heartland’s “Rudolph Round-Up” to benefit local foster children and Olive Garden’s “Pasta for Pennies” to benefit the Leukemia & Lymphoma Society. Studio 21 FCCLA (Family, Career and Community Leaders of America) Winniczuk 35-121 FCCLA meets the 2nd and 4th Thursday of each month. Members design and implement projects to better our community and world. Service Projects allow students to earn Community Service hours in a fun and inspiring way as well as developing leadership skills, traveling and competing on the State and National level. Trident Schubele 35-224 Class is an elective credit which meets 5th period and produces the school’s newspaper. Students are taught the basics of journalism. TSA D. Hall 35-208 The Technology Student Association enhances personal development, leadership, and career opportunities in STEM, whereby members apply and integrate these concepts through intracurricular activities, competitions, and related programs. Yearbook Jaime 35-223 Students develop a yearbook in a series of classes called Digital Design 1 through 4 and can earn certifications at the end of the course.